"The standard of the paper was fine." "No moans about the balance, or about questions so hard that no-one can answer them. A jolly good quiz and a credit to the setter(s). The Union Jack City was a good question that none of us could answer. Similar kinds of questions could be set about Washington DC and Karlsruhe." There were themes and pairs all around - some explicit and others more irritatingly hidden. They served up their usual offbeat mixture with: some very well crafted mugshots of pairs of famous faces melded together: a crossword round that almost (but not quite) kept a cricket theme running throughout; some explicitly themed rounds on geography, music, indoor pursuits, and sports; and an implicitly themed round on weights and measures. Bingo Quiz this week. There were plenty of 'Well I never!' 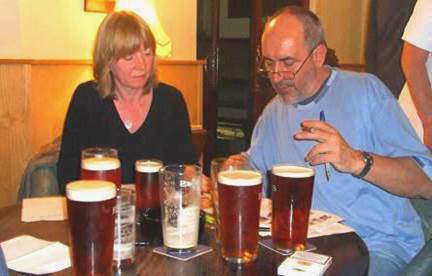 moments - always a sign of a good quiz - but also the occasional stinker (Q70: 'What cheese is made in reverse?'). Wednesday being St Paddy's day the theme was widely anticipated. Every question or answer had either a 'saint' or a 'pat' reference. The intensity of the theme diminished as the paper unfolded. So, in round one we started off with 'Saint Patrick' full on; by the end we were onto 'PAThogenic'. The setters certainly avoided the trap of getting bogged down in Ireland for 64 questions. It was happily possible for the setters to stick fairly to General Knowledge questions whilst keeping to the constraints they had set themselves. Reactions were mixed. Some found the theme wearing towards the end, whilst others commented favourably. It was a high-scoring and popular bingo-style quiz rivalling Gerry's excellent efforts when he acted as Guest setter at the end of the first half of the season. It seemed to carry the usual whimsical touch that the Brains always bring to their papers with quite a few "Well I never knew that!" moments. The one about ancient Didsbury (Question 65) was a purler (although I suspect that certain QMs found it infuriatingly long-winded).